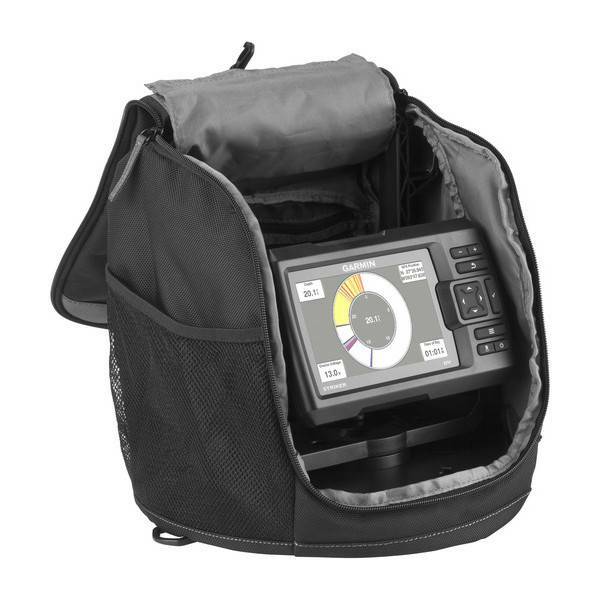 STRIKER 5 fishfinder with portable carrying case is perfect for ice fishing or fishing from a dock. Built-in, high-sensitivity GPS allows you to mark and return to your best fishing spots. You also can share your favorite waypoints and routes with other STRIKER and echoMAP™ combos. Featuring Garmin CHIRP ice fishing transducer, it also has a built-in flasher. Includes carrying case, rechargeable battery and smart charger, plus transducer, float and tilt/swivel mount. STRIKER 5 includes a Garmin CHIRP ice fishing transducer. Designed for ice fishing, it provides clear bottom definition under the ice as well as crisp, clear and wide fish arches with excellent target separation. 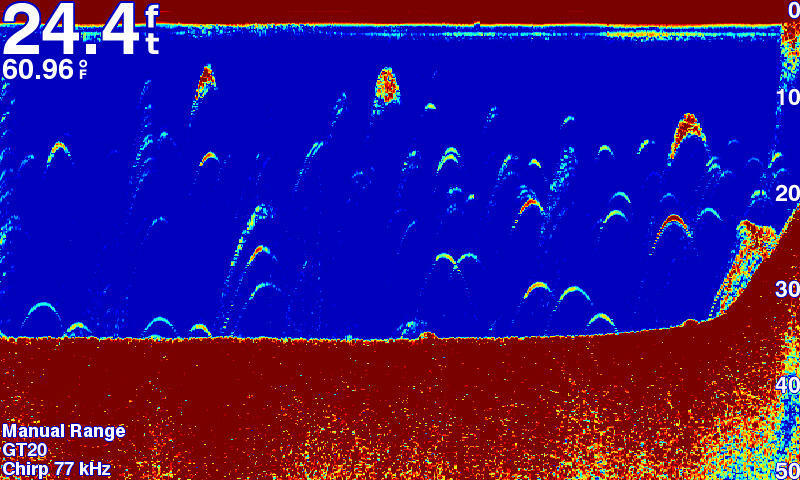 The wide beamwidth - up to 24-degree beam angle - provides a large coverage area in the water. 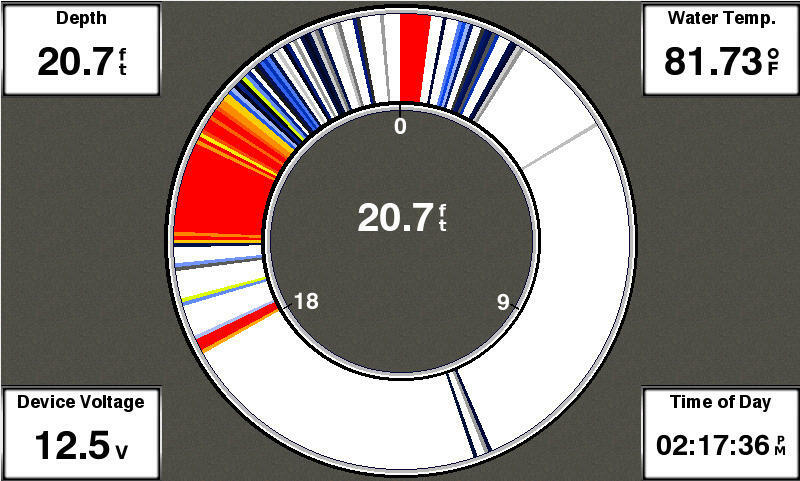 Beamwidth can be adjusted, allowing fishermen to dynamically change the beam from 24 to 16 degrees. Features high wide band CHIRP traditional sonar (150-240 kHz) and has a power rating of 250 W. Its shape and beamwidths have been optimized for ice fishing and feature a silicon-coated cable that remains flexible in harsh winter conditions.Instead of sending just 1 single frequency, CHIRP sends a continuous sweep of frequencies, ranging from low to high, then interprets them individually upon their return. 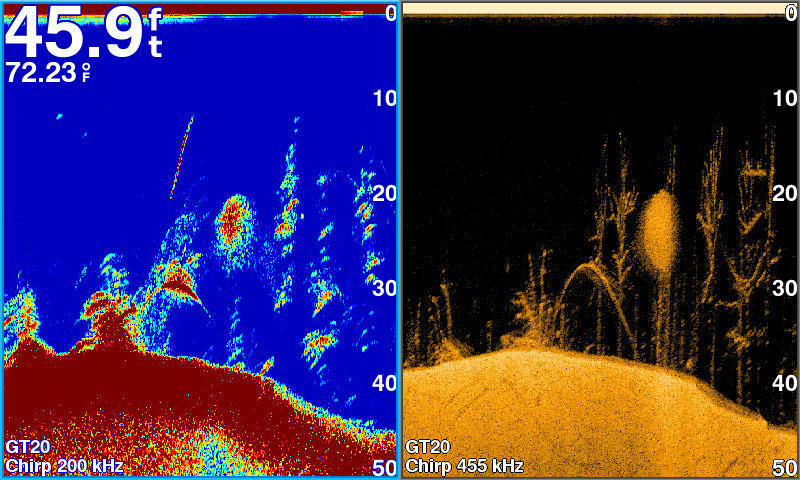 Since the frequencies provide a wider range of information, CHIRP sonar technology can create crisper fish arches with greater target separation. Unlike regular fishfinders, STRIKER fishfinders have built-in, high-sensitivity GPS to locate your current position quickly and precisely, then maintain your GPS location anywhere you go on the lake. More importantly, they allow you to mark spots where the fish are biting so you can return to them again in the future. You also can mark other locations on the lake. Just follow the path created on your screen to return to them whenever you wish. 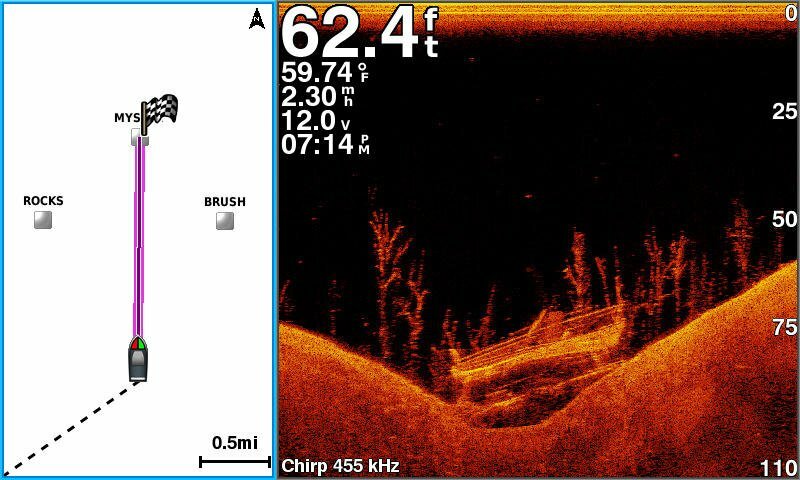 Since the STRIKER fishfinder series includes high-sensitivity GPS, you can see your position in relation to waypoints you have marked. 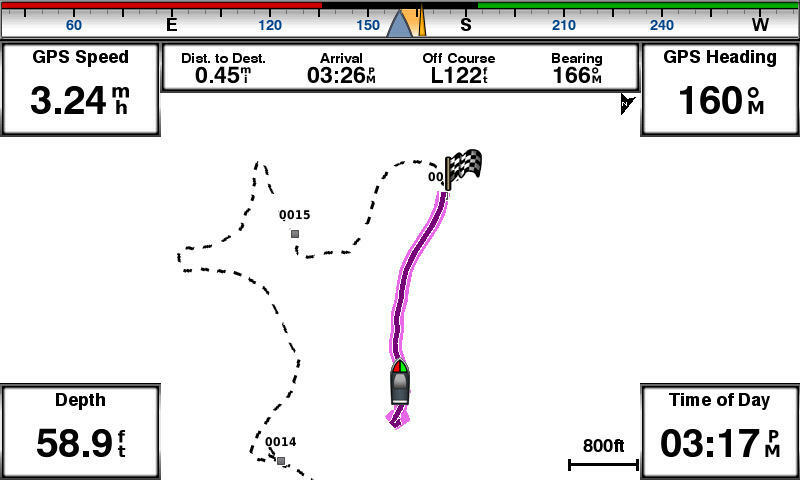 Use the waypoint map to easily view, mark and navigate to locations such as brush piles and stumps. It’s also a great tool for finding your way back to your most product fishing holes. The included portable kit protects and carries your STRIKER 5 fishfinder with GPS, so it’s perfect for ice fishing or fishing from a dock. It includes a sealed, rechargeable battery with charger, built-in transducer cable management and storage and float. For warm season fishing, add CHIRP ClearVü scanning sonar capabilities to your STRIKER 5 ice fishing kit. For CHIRP ClearVü scanning sonar, add optional Garmin GT20 transducer with CHIRP (77/200 kHz); transmit power (500 W RMS)/(2,400 W peak-to-peak) with 455/800 kHz CHIRP ClearVü (300 W power), sold separately. For high-performance CHIRP, purchase a GT22 or GT23 transducer (each sold separately).